When I travel for work, I'm fortunate that I don't have to stay in HamptonRedRoofMotel6HolidayInn-style chains. 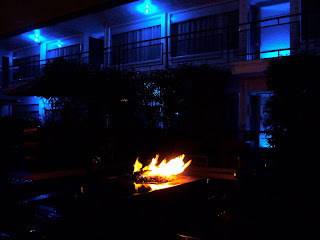 The hotel du jour for our trip to Portland was the Jupiter Hotel. 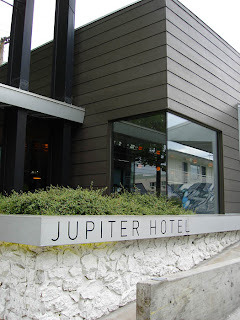 Far more of a motel than a hotel and similar to what the small boutique Ace Hotel chain has done in converting older properties in Portland, Seattle, NYC and Palm Springs into hipster hangouts, The Jupiter occupies a chunk of block on Portland's east Burnside Street. It's not a place to stay if you're a light sleeper - or one who's early to bed. 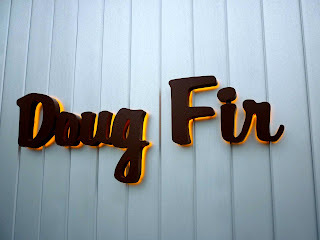 Plenty loud with twenty-somethings up at all hours hanging out after a party or a show at their on-site Doug Fir Lounge. 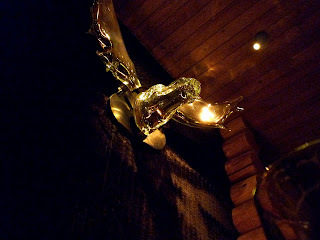 ...and a crystal moose hanging on a faux fir-covered wall. 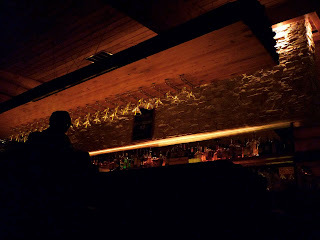 Great beer on tap and a fantastic indie-rock soundtrack playing. The food's good and reasonably priced too. The rooms are small by today's standards, but contemporary to the era of the building (1960s?). 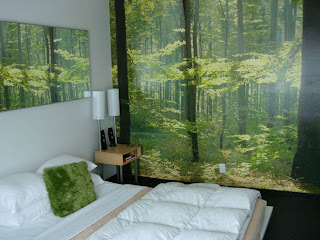 Pleasant wall mural, good bedding, IKEA-ish furninshings and speakers to hook up your laptop/iAppliance to. Two pairs of earplugs to help silence the aforementioned night owl twenty-somethings and a Jupiter-branded condom (unused of course) left on the nightstand. Oh, and a copy of Dwell magazine too. The rooms are small by contemporary standards, not surprising as the motel was likely built in the 1960s. Reasonable rates at $79-99 for my room, I'd stay here again, but my silence-loving wife would probably not sleep well. I had no issue with sleep, the old-school wall-unit AC/heater provided enough white noise to drown the din. Plus they put me on the "quiet side" of the building, probably because I am old. Photo credit - first and last photos from PurpleProofs.com 'cuz I forgot to shoot the exterior and my room.